ASPHostPortal.com is trusted web hosting provider since 2008. They strongly believe in high quality standards and hence, you’ll always find their services better than every other host in this industry. They understand the value of time and hence their ordering process is very simple. Customers can choose servers from multiple price levels to suit their business model. Today, they offer premium WordPress 4.5.3 hosting with fast speed, and uptime guarantee. WordPress has grown into what would be called a content management system, or CMS. A CMS is a tool to store all of the information required for your website and present it to your visitors in a professional, organized way. Other content management systems include Joomla and Drupal, but the reality is that WordPress is the easiest to understand, the easiest to work with, and the most easily adaptable. WordPress makes creating, editing and organising your content simple and, as a result, less time-consuming. That gives you more time to focus on other areas of your business. WordPress also gives you the chance to get a professional design to make your website look great – often free of charge. The best way to see how WordPress streamlines setting up your website is to try it for yourself. 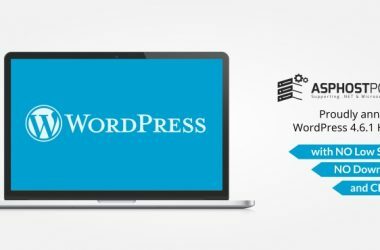 WordPress is easy to install on your web hosting or, if you sign up on the WordPress website, you can explore its features with no set-up required.